The Ballard Vale District was sanctioned as a separate school district on November 13, 1837 by Town Meeting by dividing the Osgood School District and taking the southern end for the new Village school. The Ballard Vale District school was originally located at 47 Clark Road, an was the former old Osgood Schoolhouse which was purchased and moved to that location. A second room was later added, but with increasing population in the Village a larger schoolhouse was needed. The first teachers of record 1837-1838: Miss Sarah Noyes summer terms, Daniel Fox winter term. 1839 a Miss E. B. Ballard who taught 19 weeks summer term and was re-hired for the winter term on 1839. By the end of the year in 1847, the Ballard Vale district had outgrown their schoolhouse. "At present 40 scholars were obliged to seek instruction elsewhere and others who cannot be instructed anywhere due to lack of accommodations." On Dec. 27th a special meeting was held, J. G. Dorr, C.W. Barker and A. H. Brown were elected a committee to find what kind of schoolhouse would accommodate the district, find a new location and to provide it with a fence. Five days later they reported their findings on Jan. 1, 1848. They recommended a two story building to hold 300 children, 150 in two rooms on the lower floor and 150 in the upper story. They appropriated $2500. for the land, building and furnished for occupancy. The site chosen were lots #7 & #8 on Scott Street. They had "been offered lots on Center St. but could not recommend placing a school house so near the Machine Shop Depot house or public highway." Despite their concerns this is where the schoolhouse was finally built. This property contained two parcels of land numbered Lots 19 and 32 on plan of land of John Marland and Jonathan Howe Jr. dated 1847 as recorded by Registry of Deeds, Salem, MA. Marland & Howe sold at auction on Wednesday, July 28, 1847 several house and store lots in the center of Ballardvale. The auctioneers were Loring, Abbot and Porter of Boston. Lot #32 was sold to Rebecca Constantine, wife of John on July 28, 1847 for $200.73. Marland & Howe held a mortgage loan of $188.77 which was paid off. John Marland then purchased the lot back from Constantine for $300. on March 10, 1848. John Marland then sold two adjoining lots, #19 fronting on Center St. and lot #32 on Andover St., to the Ballard Vale School District on June 1, 1848. for $367., the deed recorded on September 1, 1848. Construction began at a cost of $2300. The building was 44' long 33' wide with a 10' x 12' porch on the front. The new school was completed in time for the summer term after vacation. The new building was a source of great pride within the district, but was sort lived as the building was destroyed by fire in February 1849. An emergency meeting was held in the Ballardvale House on Feb. 22. 1849. and a committee formed to rebuild and find space where school could be held. The new school would be larger, 66' x 33'. The basement and top floors would not be finished at the time, the cost $3500. By July 3rd the building had been built and a meeting held in the second floor hall. The basement walls had been repaired, the school house cost $2800. and two back houses (Privy's") $30. tables and chairs $15. They voted to insure the building and that the basement be let out for stores. Two pails and dippers were bought along with four brooms for the schoolrooms. No water was piped in at that time. Renting out the hall was also considered as a way of supplementing the debts of the district. In February 1851 they rented out the basement unfinished room for two years to Mr. Haskins. He was allowed $200. to finish the room and $100. per year rent. The hall was rented to Laurence Whittaker for two years at $50 per year. The district had problems paying off the debts incurred which were not settled until the district system was abolished in 1866 for a municipal school system. They owned B. D. Derby money for completing the second store. in the basement. G. S. Haskins had also made improvements to his store and submitted a bill for $345.56. His rent at $150 a year, was subtracted from what he owed in rent the past two years. A bill for the difference was submitted. Evidently Haskins had made improvements to both stores as $200. in improvements were also made on the smaller store. The last six months were assessed to B. P. Derby. The district owed him $65.36 and he owned $66.03 in rent so he was billed .67 cents. The Union Congregational Society continued to rent the hall for meetings on the second floor. Over crowded classrooms in 1875 would force the School Committee not to re-new the Union Society's rental of the hall. The space was needed for classrooms. The Society would then purchase the parcel lot next door and built their own church building in 1876. The School Reports from 1853-1866 add some observations as to the governing of this school district by the teachers hired and the constant turn-over of children in this mill village. Getting children to attend school was a constant problem. The District remedied the problem by hiring the same teachers for both summer and winter terms and year to year. A continuity developed within the Primary and Senior departments that was praised by the School Committee. The 1861 reports the average attendance in the senior department was 70 scholars per term, ages 8 to 17. In the Primary department were an average of 63 per term ages 4 to 11 years of age. By 1888 the schoolhouse was evaluated by State Inspectors of Public Buildings, stating it was unfit for school purposes, inadequate both in size and amenities for instruction. In the Town Warrant on March 8, 1889 voted to elect a committee to find a location for a new schoolhouse and procure plans. In the April 19, 1889 Andover Townsman A Report on the Schoolhouse in Ballardvale published the committees report. The new building would cost $14,000, be built of brick, contain 6 classrooms and was designed by George G. Adams of Lawrence, MA. 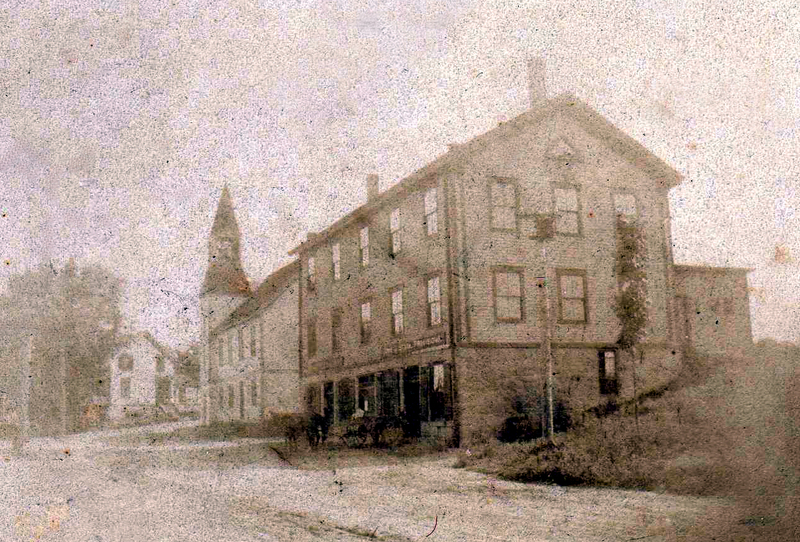 The new school was completed in March 1890. 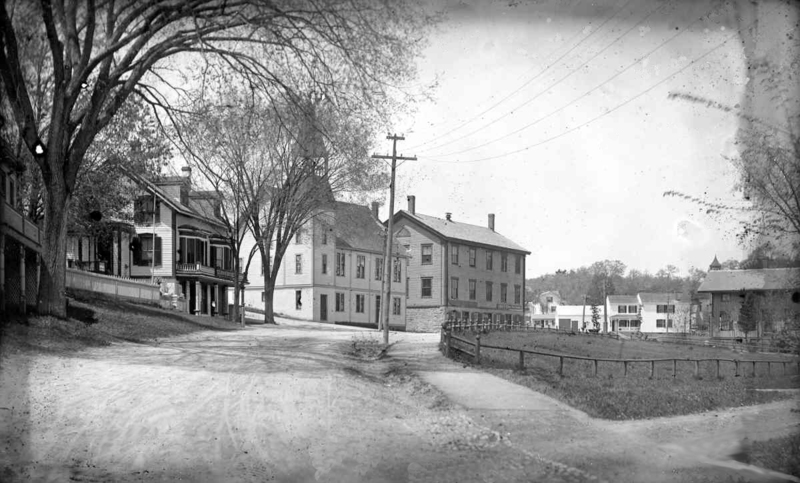 The students packed up their belongings and walked up to the new school at 149 Andover St.
Now vacant in 1890 an article, #3, in the Town Warrant on May 20, 1892 proposed selling the old Ballardvale school. Discussion on the floor suggested making on room for voting, another room for the Engine house company. and the hall upstairs for functions and with the stores in the basement bringing in income for the town. The article was postponed. At town meeting on March 10, 1893 article 24 voted $500. to repair the old Ballardvale School/ Rent would bring $342. per year. The valuation of the building was $3000. and it had not received repair for 20 years. 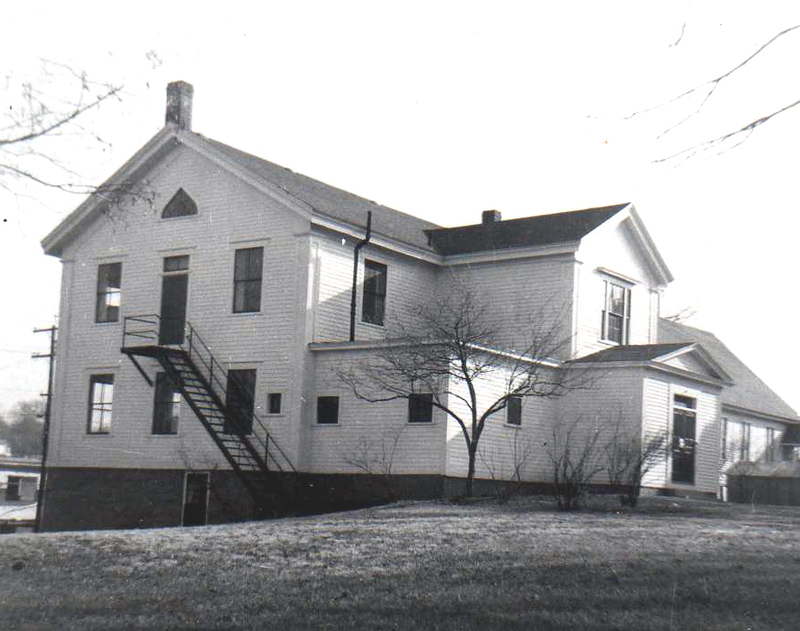 Thus began the Ballardvale Community Center which served the village for another 88 years. 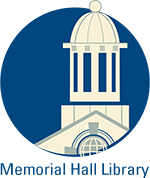 On May 6, 1913 the Memorial Hall library opened a branch on the first floor of the building. The Ballardvale Village Improvement Society was established in 1914 and in 1919 the building was renovated. Mrs. William Shaw, the secretary, reported the society had a successful year in its fourth year. "The membership is large and representative, and the entire society has cooperated heartily in making the work of the society a success." The community room was almost doubled in size by renovating the adjoining room, taking down the partition and providing folding doors. A complete kitchen outfit was installed by the society, with table equipment for seventy-five. A piano has been purchased, additional chairs and game tables." "Two banquets were given in the community room to honor the 68 Vale boys who entered the service of their country. Early in the year an honor roll and service flag was dedicated and the society received from his family the gift of a handsomely framed, life size portrait of John J. Geagan, the only Vale boy to make the supreme sacrifice." The July 4th celebration was a successful one with slogan "Every family plant a Tree" Many trees were planted in the Vale, two on either side of the front entrance to the Center. "The tree on the left donated by Mrs. Nathan Mears in memory of John J. Geagon, and the one on the right was ordered by Charles H. Lowe and will bear the name of Lewis N. Mears, who was wounded and taken prisoner by the Germans." The Community center continued to serve the Village until is was condemned in 1980. With much sadness to the residents of Ballardvale, their meeting place was razed by the town in February 1981. This site is now the southern end of the Ballard Vale Green. 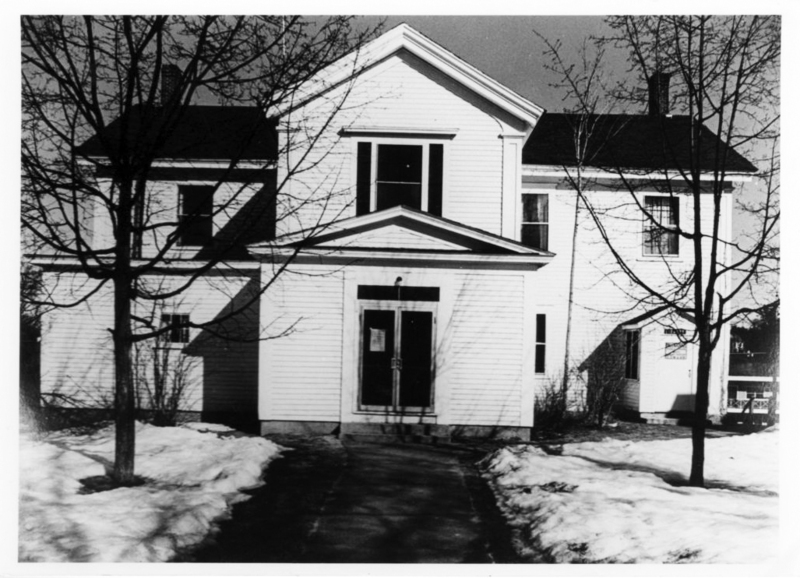 The Library branch was relocated to the corner store at 195 Andover St. and Ruth Davis Sharpe continued as the librarian. As mentioned above in February 1851 G. S. Haskins and then B. D. Derby had stores there. In 1885 "Greene & Woodin" (Charles Greene h. River St. and A. A. Woodin) advertise Schoolhouse building, Dealers of Choice Family Groceries, West India Goods and Country Produce, crockery, glass & wooden ware. 1888 - John S. Stark, Provisions Dealer - Beef, Pork, Mutton, Lamb, Lard, Hams & Vegetables was a long time tenant. and in 1943 John William Stark continues with the Provisions store. George Bruce remembers Greene & Woodin there "ran it until about 1907 or 1908. It was then bought by Roy Haynes. [1913 Directory - Haynes & Juhlmann Dry Goods - Roy Haynes h. Marland St., Frances H. Juhlmann] He ran it in "28, and then I bought him out and I ran it until "39. His voiced swelled with pride as he recalled his ownership. "Then two ladies ran it after that, and a fellow named Gardner ran it, and he closed up. It is a liquor store now.... There was a straight meat market run by John Stark and then his son, Will, ran it a good many years. He went out about '45 or '46." I was the Postmaster here from "28 to '36." This was site of the Post Office in Ballardvale when George Bruce was Postmaster. 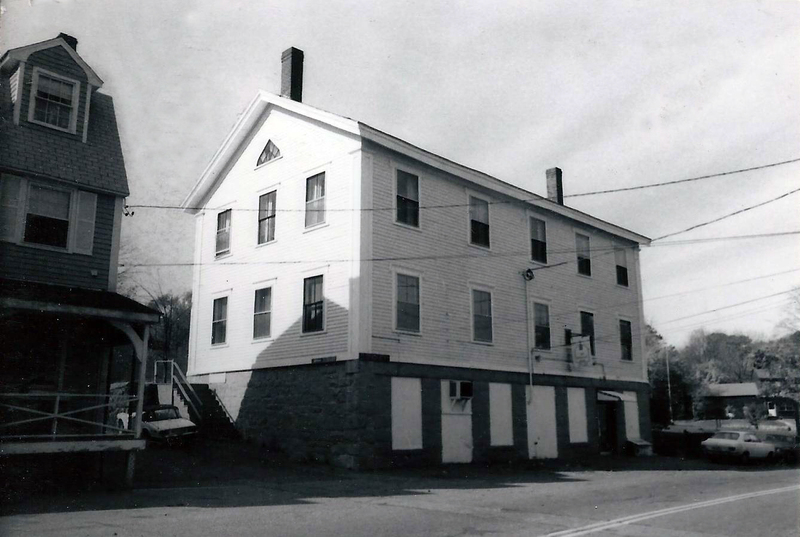 It moved to the present location at 183 Andover St. in 1936. The last tenant was the "Beverage Barn" owned by Robert "Bob" Wilton of Foster's Pond. The store carried liquor and soft drinks and relocated to 18 Dale Street in the brick warehouse building, now demolished and part of Ballardvale Crossing Condos. John Marland Mar. 10, 1848 - b. 395 leaf 113 - lot #32 - $300.